​Bayern Munich welcome AEK Athens to the Allianz Arena for their Champions League Group E tie on Wednesday. Bayern won in Athens 2-0 two weeks ago and will look to assert their dominance at home in order to take top spot off group leaders Ajax. Bayern have not been too convincing this season and pressure is rising on manager Niko Kovac to deliver results. The Greek champions are almost certain to not make the knockout stages of the Champions League, but will look to beat Benfica to third spot to secure Europa League knockout football. Here's 90min's preview for the fixture. The hosts come into the game boosted by the return of Franck Ribery, who didn't travel to Athens but may feature after coming on as a substitute in their previous two fixtures. Mats Hummels is doubtful, while ​Bayern are without the injured trio of Thiago Alcantara, Corentin Tolisso and Kingsley Coman. AEK Athens are without Helder Lopes and Marko Livaja are both suspended while the visitors are also without Anastasios Bakasetas and Marios Oikonomou through injury. ​Bayern Munich ​​Neuer; Kimmich, Sule, ​Boateng, Alaba; Martinez, ​Muller, Rodriguez; Robben, Lewandowski, Ribery. ​AEK Athens ​Barkas; Cosic, Chygrynskiy, Lampropoulos, Hult; Simões, Galanopoulos; Bakakis, Klonaridis, Mantalos; Ponce. The two sides have only ever met once, when Bayern triumphed 2-0 in October thanks to strikes from Javi Martinez and Robert Lewandowski. The Bundesliga champions are currently on a five game unbeaten run after their shock 3-0 defeat to Borussia Mönchengladbach. 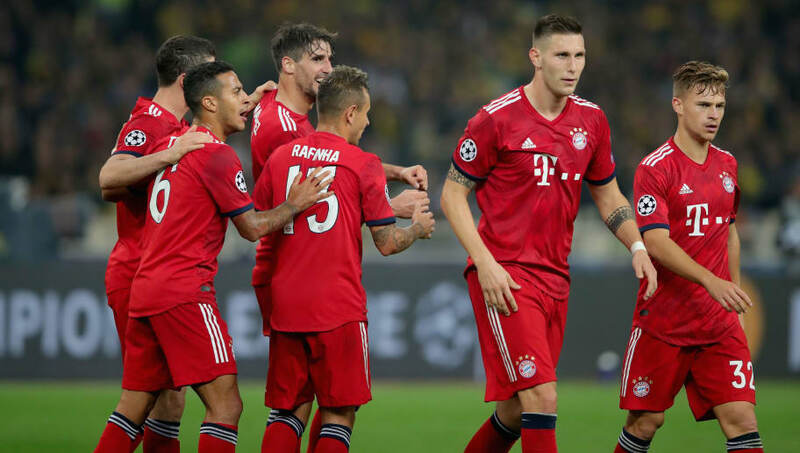 Bayern did suffer a setback in their last fixture, conceding a late goal to draw against Freiburg, meaning the holders now sit four points behind Borussia Dortmund in the Bundesliga. AEK sit fifth in the Greek Superleague, six points behind current leaders PAOK. Last year's Greek Superleague winners have been tough to beat in domestic competition this season, losing just once to PAOK, but have lost all three of their Champions League fixtures. However, Argentinian striker Ezequiel Ponce has found some goalscoring form with five strikes in eight games and will be the biggest threat to Manuel Neuer's goal. Bayern's have not won in their last three home Champions League fixtures, but AEK have lost three of their previous four ties against German opposition in UEFA competition, drawing the fourth. AEK looked out of their depth during Bayern's visit to Athens, but have kept four consecutive domestic clean sheets since and will want to transfer this defensive security to European competition. Bayern have not been up to their usual standard this season, with several key players looking a bit out of form. However, the hosts should have no problems repeating their victory over AEK from two weeks ago and will have far too much quality for the Greek side.